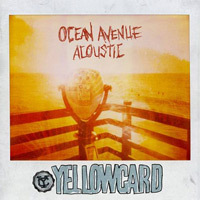 10 years ago Yellowcard released Ocean Avenue and shortly after with the album title track becoming a radio hit, Ocean Avenue became a platinum selling record and Yellowcard was launched into pop-punk stardom. Today the band returns with a re-issue of the record featuring newly arranged acoustic versions of the original album tracks. Ocean Avenue Acoustic is a collector’s piece for long-standing fans as well as an album for those fans looking to revisit 2003.